We are excited to Co-sponsor a Habitat Blitz Build again this year, and want to thank all of those who volunteered! Paul Ivie has agreed to be our project coordinator, so if anyone has questions about the registration process or project in general, please contact him at . March 30 | 8:00 am - 12:30 pm - Set tresses and deck roof. April 6 | 7:30 am - 3:30 pm - Interior wall and roof. May 4 | 7:30 am - 12:00 pm - Interior painting. 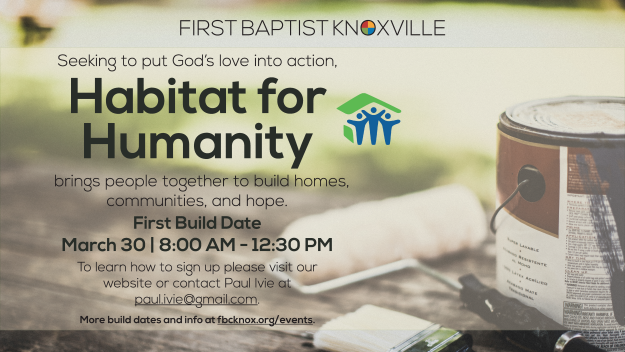 May 11 | 7:30 am - 2:00 pm - Trim and cabinets. We are glad to help Marcus and Kimeka in the building of their new home! They asked for a blessing, and they have received it with each other and with this great opportunity of homeownership. To check out their full story, please click the link below. Group leaders should be at the job site 1/2 hour prior to start time. Schedule is subject to change due to unforeseen events. Weather Policy: Work will only be cancelled at the job site. If it is raining or snowing, volunteers, partner families, and crew leaders should still come out unless the conditions are hazardous. Age Policy: Volunteers must be at least 16 years old to work on the site and 18 years old to climb ladders or use power tools.